Shape Note Oklahoma hosts a singing and singing school. NWA Sacred Harp Convention and School on October 23 and 24... And we were singing on Sunday! 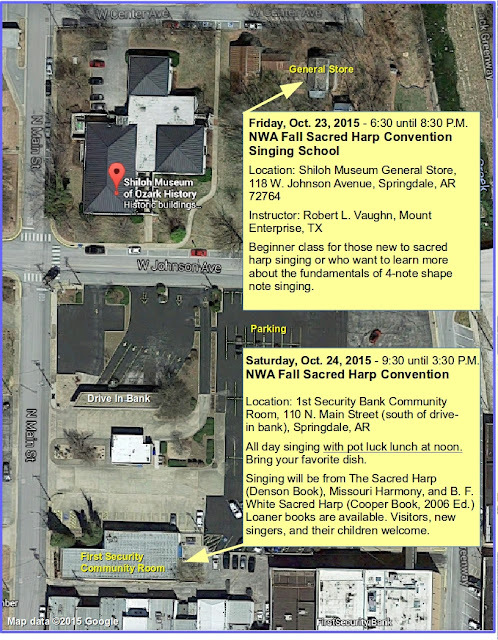 Updated: 10/20/15 - NWA Fall Singing Convention and Singing School is this Friday and Saturday! For those of you too young to remember Will Rogers, from our neighboring state of Oklahoma, he once spoke about organizations. He said. "I am not a member of any organized political party. I am a Democrat." Without going any further into any political swamp, I always get the same feeling about not quite being organized a few days before the Shiloh Singers big Fall Singing Convention and Singing School. Is there anything that we missed. Who's working on signs? Who's bringing food for the pot luck dinner? More important, who's bring desserts or cookies or donuts for breaks? But the sun rises on the appointed day. Rain or shine, the parking lot fills with cars, old and new singers file into the meeting room and as if by some grand design, all the pieces fall into place and we have one of the best singings of the year. So at this late date all I can do is hope and pray all those expressions of "It's gonna be great!" come true as the loose pieces fall into place. Just in case some of our out-of-town guests have never been to the Shiloh Museum of Ozark History, I spent a few minutes with Google Maps to give people an idea of where we're meeting and where people can park on Friday and Saturday. We'll also try to remember to print up a few extra copies of the map for those who go to the main door of the museum or general store on Saturday morning. We don't want anyone to miss a minute of the singing and fellowship that is shared at the NWA Fall Sacred Harp Singing Convention. It's a fine tradition and "It's gonna be great!" October 11th Singing at the Museum - The Shiloh Singers enjoyed the company of 25 singers at the Sunday afternoon singing in the General Store. We were also visited by "Mr. T" the neighborhood cat, who doesn't sing but occasionally poses for pictures with children and visitors. Well done Shape Note Oklahoma singers for hosting a wonderful singing school and afternoon of singing on September 26th. Katy and I were on our way to Yellowstone, but Syd Caldwell sent us a sample of the singing via cell phone, later sent several pictures from the event, and a glowing report on the school and singing. Sounds like everyone had a good time. 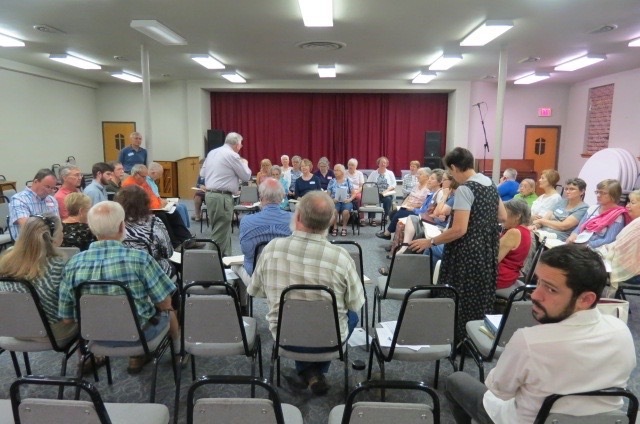 Dan Brittain leads the singers at the First Lutheran Church in Tulsa, OK on Sept. 26, 2015 singing school. Singers at the Tulsa event enjoy lunch and fellowship during the noon break. The Shiloh Sacred Harp Singers of Northwest Arkansas will host their regular October singing on Oct. 11th in the General Store on the grounds of the Shiloh Museum of Ozark History in Springdale. The singing will start at 1:30 P.M. and conclude at 4:00 P.M. This will also be our last chance to review plans for the NWA Fall Shape Note Singing School and Convention in Springdale on October 23 and 24. The 10/23 Singing School will be held from 6:30 until 8:30 P.M. in the General Store, where we usually sing. The Saturday all-day singing will be held in the 1st Security Bank Community Room, just south of the drive inbank across the street from the Shiloh Museum. The singing will start at 9:30 A.M. and conclude at 3:30 P.M. with a pot luck noon meal. 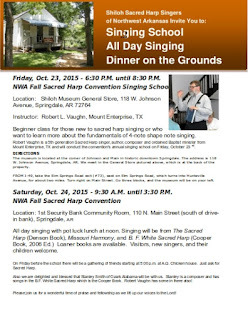 Note: Click on the thumbnail for a full-sized PDF copy of the flyer with details about the NWA Fall singing School and Convention. Thanks to the Sacred Harp Publishing Co. for sharing their New Online Exhibit: The United Sacred Harp Musical Association. Since its first session in Atlanta in 1905, the United Sacred Harp Musical Association, commonly known as the United Convention, has stood out as more than just an ordinary Sacred Harp singing, affecting the form of The Sacred Harp and public consciousness of our traditions. The story of the United Convention—told here through recordings, photos, and more—offers a fascinating perspective on the history of Sacred Harp singing in the twentieth century and beyond. One more thing about Sunday's singing: Any singers or visitors who wish to join the singer's table at AQ's Chicken House in Springdale for chicken and dumplings or other chicken dishes are welcome to arrive around noon this Sunday. Just ask the reception desk for directions to the singers and they'll point you in the right direction. It's a good time for old friends to visit and for new singers to ask questions about Sacred Harp singing. Hope to see you all at the October singing on Sunday. April 14, 2019 - 1:30 P.M. until 4:00 P.M. Shiloh Singers Monthly Singing in the Shiloh Meeting Hall at the Shiloh Museum of Ozark History, Springdale. April 28, 2019 - 1:30 until 3:30 P.M. - 4th Sunday Singing at the West Fork Library Hall, 210 Garfield Ave. in beautiful West Fork. New Singers and visitors welcome. May 4, 2019 - 9:30 until 3:00 P.M. - Northwest Arkansas Sacred Harp Singing Convention at the St. John's Episcopal Church Parish Hall. Pot Luck Lunch at Noon. Singing from The Sacred Harp and Missouri Harmony. Books available for loan or purchase. May 12, 2019 - 1:30 P.M. until 4:00 P.M. Shiloh Singers Monthly Singing in the Shiloh Meeting Hall at the Shiloh Museum of Ozark History, Springdale. May 18, 2019 - Old Historic Washington Singing, Historic Washington United Methodist Church, Old Washington, AR. 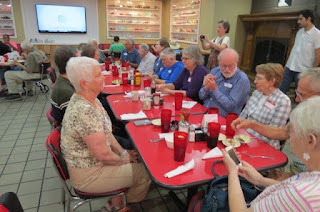 May 19, 2019 - Old Folks Singing and Dinner on the Ground, Tull United Methodist Church, Tull, AR. July 11-13, 2019 - Annual Shape Note Singing School and Gathering with an All Day Singing on Saturday, Ozark Folk Center in Mountain View, AR. The Shiloh Sacred Harp Singers of NW Arkansas normally sing on the 2nd Sunday of each month in the Shiloh Meeting Hall on the grounds of the Shiloh Museum of Ozark History at 118 W. Johnson Avenue, Springdale, AR 72764. Check the calendar section above for our next singings. Our thanks to the Shiloh Museum for helping us preserve a pioneer singing tradition. This work by Shiloh Sacred Harp Singers of NWA is licensed under a Creative Commons Attribution-NonCommercial-ShareAlike 3.0 Unported License. Our sincere thanks to Shannon Seyler, a former member of the Shiloh Singers and a fine alto, who developed the group's original website and gave us permission to use the "Who we are" and "FAQ" pages from that site. We wish Shannon and her husband all the best in their new home.